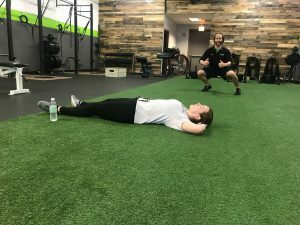 “How long should I rest between sets?” This is a great question that unfortunately has an annoying response, “It depends.” Like almost everything else in the fitness realm, the answer is going to differ depending on what your goals are. However, here are a couple guidelines to follow depending if you’re lifting for hypertrophy (fancy term for building muscle), strength (in the 1-5ish rep range), or muscular endurance. For hypertrophy (again, science term for building muscle), the typical set is between 8 and 12 reps. Sometimes a little more, sometimes a little less. The rest time between sets on these should generally be about 60 to 90 seconds. This doesn’t mean you need a stopwatch, and anything outside of that window destroys your gains. It just means that if you’re ready to do another set after only maybe 15-30 seconds, that you probably aren’t working your muscles hard enough to elicit a muscle building response. You want a challenging enough weight that you need a minute or so before you go again. For strength (we’re talking maximal strength here, so 1-5ish reps), the rest time should generally be around 3-5 minutes. Sets with this few reps are much more challenging on your nervous system than on your muscles. Even after your muscles feel recovered, your nervous system will prefer an extra minute or two of rest time. For muscular endurance, the load you use is going to be much lighter, and is typically 15 or more reps, or for time instead of a specific rep number. The rest on these is going to be the shortest of the 3, at around 20-30 seconds. The goal on these is to start again before you feel fully recovered. If you find yourself needing a minute in between sets, you’ll be leaning more towards the hypertrophy side, and less towards the endurance side. Keep in mind that these are all general guidelines. As I said earlier, it’s not crucial to have a stopwatch and stay precisely in the exact window of 60-90 seconds to build muscle. So don’t get too crazy about it. Just don’t get locked in to your phone for 12 minutes between sets, and you’ll probably be alright!